As a lifelong debunker of all things mythical, fantastic or otherwise unbelievable, Dr. Randolph Stein has heard his fair share of tall tales. Thus far, he’s been successful enough at proving their inaccuracy that he’s become widely accepted as one of the world’s leading experts. So it’s only natural that when a deep sea voyage in search of the fabled city of Atlantis goes missing, Stein is the first man to sign up for the next dive into those same deep waters. But when the state-of-the-art submarine he’s aboard starts to experience unexplained phenomena, the professor decides to test the certainty of his beliefs by climbing into a one-man pod and personally inspecting the dark walls of seawater outside. It isn’t often that a mainstream comic inspires the kind of awe and wonder that must have been prevalent during the birth of the superhero genre. These days, we’ve become so accustomed to the very idea of a man with wings or a hero with the ability to create fire from thin air that such acts have lost their luster to a certain extent. How does a writer capture his audience’s imagination when such spectacular feats have become so commonplace, they inspire more yawns than gasps? The Depths author Peter Milligan’s answer is simple in concept, but infallible in execution: limit our exposure. When something as ridiculous as an undersea monster has been seen so frequently that it’s no longer a shock or a surprise to the reader, it loses its value. In centering this story on the overly cynical Dr. Stein, Milligan has given the series a flavor that has more in common with the daily news than its illustrated contemporaries. Stein speaks as I’d imagine you or I would when confronted by such baseless superstition in the real world, and the effect is disarming. It takes us out of the typical comic book mindset, convinces us this is a different form of entertainment, and only then introduces that sense of the unknown. Esad Ribic provides gorgeous painted artwork that’s different enough from his contemporaries to finish driving that point home. His work doesn’t aim for precise realism, a trap that snares many painters within a comic’s format. Instead, he focuses on toeing the fine line between cartoony exaggeration and grounded realism. His characters are vividly lifelike, but simplified enough to maintain the tone of the story. Ribic’s style is perfectly suited for a tale set entirely underwater, and he makes the most of it. Combining unique lighting opportunities with a cool, calming color palette, he immediately convinces us that we’re aboard the submarine right alongside the doctor and its crew. The scenes that take place alone in the abyss are mesmerizing, overflowing with blacks and deep blues. From cover to cover, Ribic concentrates on solid storytelling and fills the page with soft, ethereal waves of color. He’s a great find, and I can’t wait to find out what he’s working on next. In this series, Namor is less the wing-footed egomaniac that we all know, and more the spooky, unexpected blur of motion in the corner of our peripheral vision. He appears for all of one panel, and even then only as a silhouette, but the effect he has on the nearby crew tells us everything we need to know. 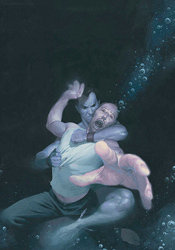 Sub-Mariner: The Depths needs all but two pages to capture its readers’ hearts, minds and imaginations. It’s extraordinary, a welcome return to the very basics of the medium, and something everyone can enjoy. Buy it and share it with your friends. Stories like this one are what comics should be all about.